There are many decorations and transportation nursery decor for a baby boy's room that you can make yourself just like the ones that I made. My DIY crafts ideas include boats, trucks, cars, and pretty much every mode of travel that anyone could want. My husband is an LAUSD middle school teacher and he was one of the teachers that were laid off during the time that I was pregnant. The loss of a paycheck really motivated us to get creative and to take a DIY approach to the nursery decorating project. many items featuring trains, boats and planes for your baby boy's nursery room. Working with a very tight budget on hand... here are the ideas that we came up with for Adam's room. Our baby boy, Adam, was born on May 4th and we share a space in our bedroom that we set aside his nursery. It was a bit of a challenge to fit his crib on one side of the wall because the room is not very big so I had the idea to slant it against the corner of teh room so that everything would fit. 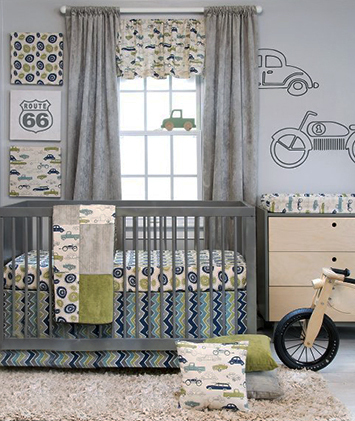 Visit our gallery of Baby Boy Nursery Pictures to see more projects featuring cars and trucks. My mother (whom I thank God is still alive and well) bought the transporation baby bedding set and the color scheme of our transporation nursery decor is based on the colors that you see in the crib quilt, bumper and fitted sheet. Once we had the crib set, I began to piece my son's nursery together filled with happiness and anxiously awaiting his birth. We bought nursery decorations from Walmart and Big Lots plus we received many wonderful gifts to match our baby boy's nursery that were given to us from our family and friends. This is my first time entering a contest so I'm not sure what more to say except that I hope we win and remember and that I hope you enjoy the pictures of baby Adam's nursery. I would like to mention that even during tough times like these you can find bargains. I would also like to add a thank you to all our friends and family's support during these tough times. I would never have known that you were working with a tight budget by looking at the picture of your baby's transportation nursery ideas! What more could a mom have ever wanted? 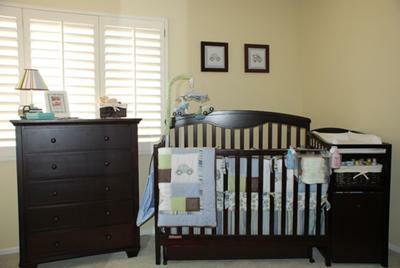 Baby Adam's nursery is absolutely precious. Your story touched my heart and I'm sure that other moms will find your positive attitude as inspirational and uplifting as I did. All the best to you and Baby Adam, Krystyne. And thanks so much for sending in your transportion nursery photos! My husband has a collection of toy cars that I would like to display in our son's room that will have a combination ABCs and transportation nursery theme. They go well since the alphabet letters are also in primary colors. Does anyone have any ideas about using the cars to make car themed artwork or decorations that they can share? Pictures or the address where I can find tutorials would be helpful as well. I am selling most of the items from this set on OfferUp. Take a look, it's a phone app. Kidskraft is the maker. I really need to know the brand and name of the crib set. This is so cute and sweet but all boy! Join in and write your own page! It's easy to do. How? Simply click here to return to TRANSPORTATION BABY NURSERY THEME .